A perfect spot to travel with our family...the house was beautiful and clean. We had everything we needed and much more space than we expected! We will be back and happily recommend this house to our fiends. 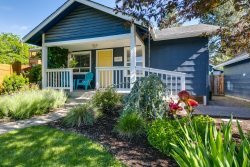 This charming bungalow was everything we were looking for. We really enjoyed having a nice quiet place in a great neighborhood, walking distance from downtown. It was clean and as advertised, and met all of our needs. We would definitely stay here again! Charming, cozy spot. Felt right at home the moment we walked in. The home was cozy yet bright with just the right amount of space. Great attention to detail: nice linens, comfy bed, kitchen well stocked with essential cooking items. Hot tub was great at the end of a day of skiing. Its well located to enjoy all that Bend has to offer. Great communication during the booking process and a check in after we arrived to make sure we had everything we needed. Well definitely be back on our next visit. totally awesome place and City! Will be back again and stay in same place. hot tub and bikes were awesome! While this is a holiday rental (many are in Bend), it feels like a home and is well equipped. The hot tub was a bonus and we sat in it while the snow fell around us. We did not use the extra room but it looked well set up. Walking to downtown is easy although we did not as there was easily over a foot and half of snow left from a previous storm. Great bathrooms, one with old deep tub (shower) and the other a nice shower. The twin beds in room two they pushed together for us before we arrived. Great choice. The house is in a great location close to downtown. Oregon has received epic amounts of snow this winter, but the hosts had been shoveling the drive, walkways and decks, so getting into the house was easy. We loved using the hot tub after days on the slopes of Mt. Bachelor or out snowshoeing. This house is absolutely charming. It is clean and cute and very nice inside. Loved the hot tub. Great master suite. Super convenient and walkable to downtown. Very quiet neighborhood. I would definitely come back. Loved the wood burning stove! Stay 3 nights over a chilly rainy weekend and had fires all the time. Darling place with all the amenities needed. Always appreciate the nice linens and towels provided. Bluebird Vacation Rentals does a fabulous job with all of their properties. We loved it. The house was perfect and works great for a group! plenty of places to hang out together or find some quite space away from the group. Definitely will want to stay here again! We had a wonderful stay at the Kingfisher Bungalow. The home was clean, comfortable and well-equipped. The location was fantastic - close to the river and downtown! We would definitely stay again and truly appreciated the hospitality of the property managers. Great house in great location! The home had everything you needed, and loved the bikes and hot tub. Will definitely stay again next time were in the area. The Bluebird Day hosts were accessible and friendly, and the house was just as described -- clean, lovely space, accessible to riverside trails and downtown. We loved staying there! Very cute place, we enjoyed our stay very much. Location was central, although quite a walk to downtown area. Outdoor space was great, with the hot tub and seating areas. I would go back for sure. Bedding was comfortable too! Great place I highly recommend! My 1 year old daughter, husband and I stayed here for a long weekend and the location is ideal.Mt. Bachelor was a close 20-30 min drive and I especially loved that we could walk into downtown Bend in 10 min. The hot tub was great and the hosts provided Everything you could think of (coffee, Restaraunt menus, bikes etc) love! The location was great! We were able to walk downtown for dinner. It had everything we needed for a very comfortable ski vacation, including a hot tub to help relax after skiing. The Kingfisher home was lovely and so cute!Great location, clean, well stocked, and the beds were extremely comfortable. When we arrived a little after 3pm, there was a water issue that workers were addressing and the cleaning crew was still at the house finishing up. Because of this little hiccup, they were very accommodating went above and beyond to remedy the inconvenience. They also had great communication throughout our stay. I would highly recommend staying here! We rented the Kingfisher house, including the additional back house, for our recent trip to Bend, and it was perfect! The house is located very close to the downtown shops and restaurants on Wall Street, and at the end of the street, there is a great path/bridge overlooking the rapids. The house is wonderfully renovated and very well kept, it is very bright and inviting, and the hot tub is the perfect touch. We would recommend this house, and we would definitely stay here again. Bluebird Day was very responsive, helpful, and easy to work with. Fantastic accommodations! We loved the comfort of this home paired with the interior design and great features: hot tub, bikes, and the amazing location! We walked everywhere, it was a blast! Thank you! "WOW"! What an amazing space and beautiful vacation home. We enjoyed every second spent in the Kingfisher Bungalow. The hot tub and back yard with the beautiful water feature pond were enjoyed every evening after soccer tournaments. We loved walking to the river and the fun shopping so close by. The peace and serenity of the neighborhood and area was unbelievable. We look forward to coming back next year! The Kingfisher Bungalow is a beautiful place! Sunny, with the most wonderful beds, fluffy pillows, a great kitchen-- fully equipped, a hot tub, wood burning stove, a darling garden... I felt so very lucky to be able to stay here! 4 bikes to ride through the quaint neighborhoods, the home is in an amazing location!! We didnt want to leave. We have traveled extensively, and this is with out a doubt a 5 star vacation home! We have already reserved this dreamy bungalow for our vacation next year! Opening the door to the Kingfisher Bungalow telegraphed immediately that my stay in Bend, Oregon with the bungalow as a home base, would be extraordinary! The charm, appointments and attention to detail, are exceptional, such as: fine beds and bedding, plenty of hot water, nice towels, anything in the kitchen one would want, made it feel like home, and then some! The location is absolutely wonderful! Anyone who is lucky enough to stay in this bungalow is in for a 5 Star treat!! We stayed in the kingfisher bungalow during a crazy snow storm and had such an amazing time! We prepared big extravagant meals in the beautiful open, well equipped kitchen. We entertained our friends in the cozy and beautifullly decorated living room (all our friends that visited fell in love with the house!). And when we felt like getting out, we pulled our daughters downtown in a sled (so fun!) and had some amazing meals at the local breweries. It was such a great get away, and the owners were more than accommodating, they were kind and generous as well! We will 100% be back, next time in the summer so we can take advantage of those bicycles that they provide! Dont miss out on this place!